UK Drug Tariff Ref. No. 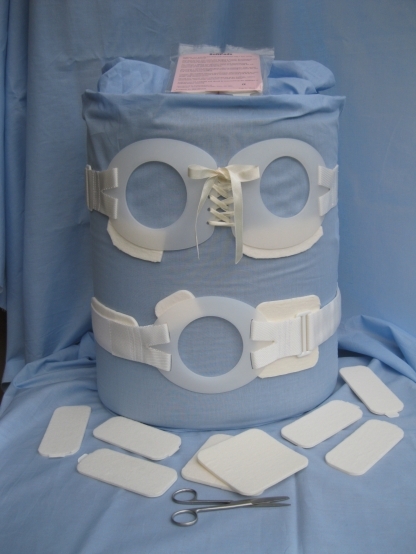 This stoma care product is used for protecting the skin and surgical operational scars from chafing by ostomy hernia belts, corsets, straps, buckles, waistbands, trusses etc. Softpads are a 3mm thick polyethylene foam pad laminated with a non-sterile 100% cotton material. The 100mm non-adhesive square pad should be used between the body and the offending article or appliance with the soft cotton side of the pad towards the skin. The 52mm x 120mm hypoallergenic adhesive rectangular pad should be stuck directly to the appliance or article of clothing to protect the skin and scar tissue from chafing. The pads can be cut with scissors to any preferred shape. After sticking pads onto a belt or flange any uncovered adhesive should be dusted with Talcum Powder to prevent pads sticking to where it's not wanted ! To RE-ORDER Softpads please telephone Sash at the number below. We will obtain a Doctors prescription for you (unless your GP uses a Prescribing Service in which case you would have to obtain the prescription yourself) once a prescription has been received we will post the SoftPads direct to your home address by Royal Mail. Each pack of SoftPads contain 2 large squares and 6 rectangular adhesive pieces.